The Dig Issue: The greenhouse is warm? I decided to throw myself into the lotty again this weekend and to get it looking like a place where vegetables might in fact grow! At the moment it's trying to look like a football pitch with all the grass growing over it so I think a few hours of work should get it looking good again. 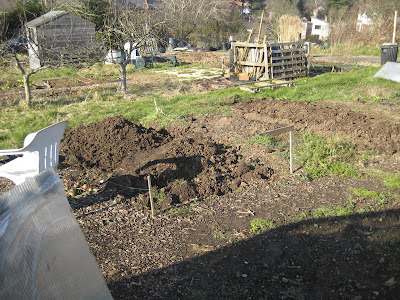 I started digging a rather ridiculously grassy part where the onions were last year and got half of that bed done on Saturday. (Finished it on Sunday). 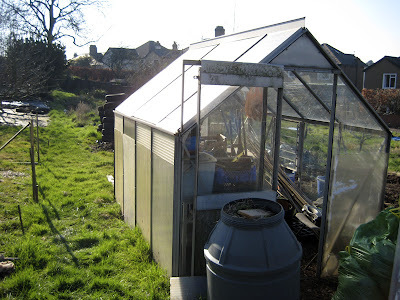 I went up on Sunday and saw Dave there, I had my drill with me so we both had a go at fixing the missing panes on the greenhouse. We had about 4 massive gaps where wind/rodents/rain etc was getting in so we patched up those areas. 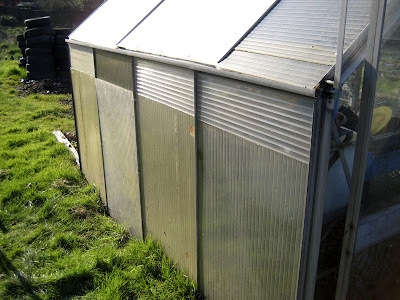 You can tell it's sealed as the greenhouse is....warm! It's incredible! I'm afraid to say that we fixed most of the greenhouse with wire but it does work!! I drilled around the panes and tied them up with wire using the metal supports. 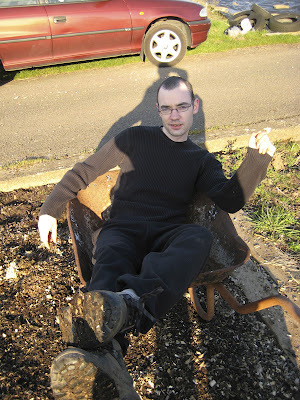 Karl dug up the weeds surrounding the pathway and dug over the runner bean patch from last year. 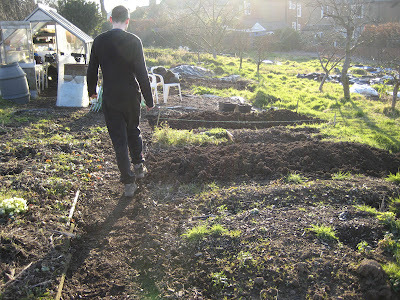 I started on the brassica patch by the woodchips and where slugs may be nesting. I have a cider-death plan for March to kill off the blighters! The lotty is really starting to look great and if we don't have a soggy summer, we should have a good year. I'm a tiddly bit excited!! Yes, I know it's wire but the greenhouse is old and we don't really know how to fix it properly. We're improvising! 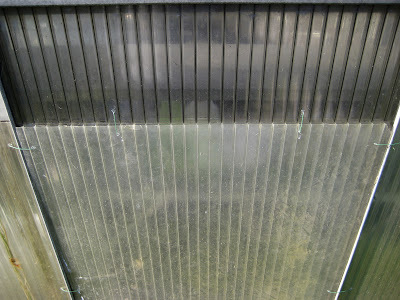 You can tell it gets very windy here as one side of the greenhouse is glass and the other side is purely poly! A few smashed panes there from falling clutter! 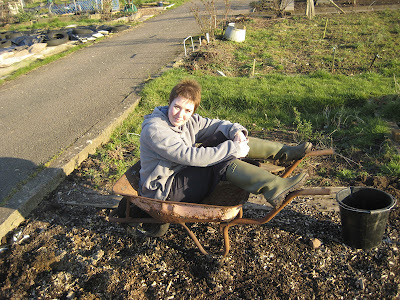 After mending the greenhouse, cleaning the greenhouse, digging 2 patches and filling 3 garden bags of weeds it was time for a rest...in the wheelbarrow! Pleasing to see the path again! 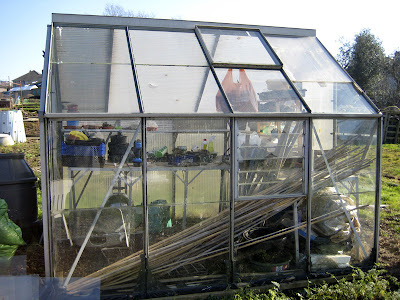 Your greenhouse is easy to repair, although I think you have done a great job anyway.